At Weighwell, our train weighing systems are enhanced and supported using our ptwX software. Created and designed for maintenance and manufacturing depots, our easy-to-use software allows for real-time displays of wheel information and can interpret any weight differentials in relation to the full locomotive / railcar such as wheels on axles, axles on bogies and bogie differences. Whether it is a new train or has undergone recent vehicle modifications, our ptwX software can provide fully customised and accurate reporting options relating to individual wheel, axle, bogie or total vehicle weight. Developed with the customer in mind, you can also choose from eight different weighing units such as kilograms or kilonewtons and see past reports using an in-built SQL-database. The importance of a well-balanced train is vital to achieving maximum efficiency, improved ride quality and ensuring low maintenance costs. However, very rarely are individual carriages perfectly balanced and as such, all new trains are required to be weighed to conform to meeting minimum standards such as permissible axle loads, cross-axle variations and side-to-side balance. 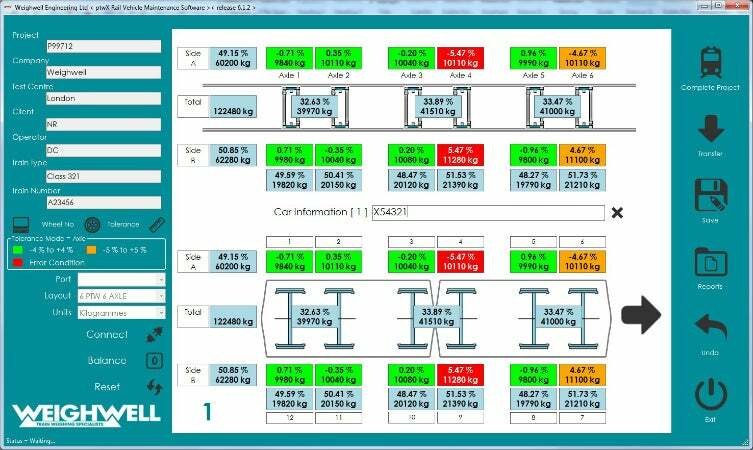 The key advantage of using our ptwX software is that it can graphically document weighing results instantly in relation to the train’s configuration and ultimately aid train maintenance depots and rail workshops by highlighting possible issues relating to safety and loading symmetries. This is beneficial in providing the information needed to satisfy train safety regulations. The consequences of an imbalance in weight distribution can result in issues relating to performance, operational and safety requirements.